I owe a lot to the photographer Bruce Barnbaum. 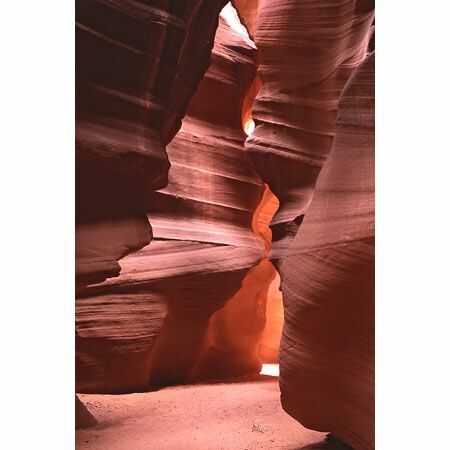 In Dallas, I came across one of his black and white images of a slot canyon on a card. It had the quality I was looking for (see Great Sand Dunes). This was in 1990. I still have the card today. That was all I knew about slot canyons, and that they were prolific in the southern Colorado Plateau (Arizona/Utah border). With good friend Dan, we had two weeks in Summer 1991 exploring the desert and had great success in Monument Valley and Great Sand Dunes National Park. We were heading west to Bryce Canyon and Zion National Park. We stopped in Page, Arizona for the night. Page was built for the workers who constructed the nearby Glen Canyon Dam creating Lake Powell. We stopped at the tourist centre at the dam, for this was our first visit here, and I asked the officer if he had heard of ‘slot canyons.’ I always felt that he furtively looked both ways before reaching under the counter and handing me a much-photocopied hand-drawn map. I wish I still had it. ‘Leave early, carry lots of water’, he said. Here I need to apologise to the Navajo people, for I was unaware that I would be trespassing on their lands and without their permission. The map was straightforward – head east on Highway 98, park where you cross the first ‘wash’ (dry riverbed), and head south two miles. So, early the following day we arrived at the bridge, donned our rucksacks with camera gear and supply of water and energy bars, and headed up the dry wash. There were no trees or shade, just the wide, winding sandy wash – slow, hard going on loose sand. At least an hour passed, with us trudging through the sand, when around the corner, in the distance, the wash disappeared. There were red sandstone faces on both sides of the wash, and now another sandstone face appeared across, in front of us, 50 feet high. But there was an area of black in the sandstone, and as we got closer, we found it was an opening, and right up to it we could feel a cool breeze blowing from within. We stepped inside – and into a wondrous red cavern called Antelope Canyon. That was the most wonderful photographic experience – all alone in the hot desert, photographing this beautiful natural wonder. We had, by leaving early, arrived at the optimum lighting time and photographed as hard and fast as possible for two hours (the lighting changes all the time as the sun passes overhead). Then the overhead light had gone, and we left the canyon and walked back down the wash, the afternoon sun beating down on our backs, our spirits soaring with where we had just been. Back down to the bridge, I realised that I would never be the same again. Those were the days…generally now you can only visit with a Navajo guide, delivered by truck up to the entrance of the canyon. The arrival is still dramatic and worthwhile, but the journey will never be like that again.